Seoul Selection is looking for a part-time Korean-to-English translator, preferably one who majored in economics. If you’re interested, please send a resume and cover letter to atoz@seoulselection.com. The Seol holiday is upon us once again! One of Korea’s two biggest holidays, the lunar new year is a busy time—Korean families spend much time and effort preparing gifts, traveling to their hometowns, holding ancestral rites and readying tremendous amounts of food. For international residents, though, it can be a bittersweet time—everybody appreciates the days off, of course, but the holiday can be lonely, too, especially for those without families. That much of Seoul empties out and/or shuts down doesn’t help. Don’t fret, though—there’s still plenty to do on the holiday. On Jan. 31, you can visit Seoul’s four royal palaces—including Jongmyo Shrine, but excepting Changdeokgung Palace—for free, and throughout the holiday the palaces host a variety of Korean traditional games. Gwanghwamun Plaza and Sejong Cultural Center will also be hosting games, craft programs and performances. Namsangol Hanok Village hosts holiday programs, including tteokguk (rice cake soup) tastings and traditional games. And entry is free. Don’t forget the National Gugak Center’s Seol performance (Jan 31, KRW 10,000), either. Getting out of Seoul can be a bit of a nightmare on the first day of the holiday, but exploring some of the destinations on the edges of the city’s extensive commuter train system—like Chuncheon and Suwon—can be quite fun. For a fuller rundown on the holiday’s events, see this link at the KTO. – Three foreign interns are experiencing Korea’s unique work culture. – “The Attorney” gets a North American release. – A chicken dish in Itaewon is causing a debate over racism. – Gamers aren’t happy about efforts to clean up the PC bangs. – Busan’s beautiful seaside Haedong Yonggungsa Temple. – A beautiful year in photos. – Jeongdongjin can still be beautiful even when the sun doesn’t rise. – Dale goes to Mt. Maisan’s Tapsa Temple. 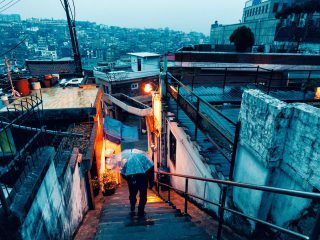 – Neal explores Itaewon and Mt. Namsan. – I’ve got a 365 Project going at Ye Olde Photoblog. The New York Philharmonic Orchestra is returning to the Seoul stage after its historic inter-Korean performances in 2008 and 2009. Under the masterful baton of music director Alan Gilbert, the orchestra will collaborate with Korean pianist Kim Da-sol on Feb. 6 for a program charged with Beethoven’s “Piano Concerto in C minor Op. 37” and his opera “Fidelio.” Celebrated Japanese jazz pianist Makoto Ozone will collaborate with the orchestra the following day. The concert tour is organized by the Kumho Asiana Cultural Foundation. GETTING THERE: Nambu Bus Terminal Station 남부터미널역 (Line 3), Exit 5. Transfer to shuttle bus, or green bus No. 4429. The Insa Art Center is holding an exhibition with 120 pieces of Park Soo-keun’s oil paintings, drawings and watercolors to commemorate the centennial of his birth. Park is one of the most representative artists of Western-style painting in Korea. He depicted typical Korean lives from a perspective which is humane in its view of family and neighbors. He also established his own unique artistic mode, using deep local colors. Park passed away in 1965. Join Koreans and internationals to make new friends (or potential partners) in a modern way. Side dishes and all-you-can-drink wine available. Nothing is more beautiful than the winter snowscapes of Seoraksan! The RAS is once again offering its very popular New Year excursion to the magnificent Mt. Seoraksan in Gangwon-do. In addition to the usual magnificent beauty of this scenic area, participants will have the possibility of enjoying the Cheoksan hot springs on the first night, and to extend the pleasure on the second day at the Seorak Waterpia, a large-scale hot-spring resort. ADMISSION: KRW 248,000 for members and KRW 297,000 for non-members. MORE INFO: See this link. GETTING THERE: See link above. Cheongna Dalton School is the only International School fully accredited by both the Korean Government and Western Association of Schools and Colleges. 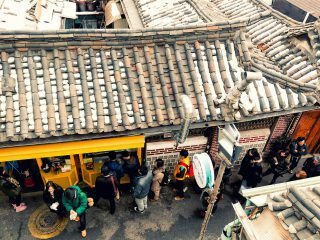 The popular Samcheong-dong Hotteok shop in Bukchon Hanok Village. Photo by Robert Koehler. *Click the photo to see a full-size version at our website. NOTE: If you have a photo you would like to see in our Everyday Koreans section, please sent it to story@seoulselection.com. Photos should be AT LEAST 950px wide. Send a one-line bio, too. Seoul Selection Offline Bookshop Sale: One of the greatest repositories of Korea-related English-language books anywhere, Seoul Selection is offering a 10% discount on any and all books published by Seoul Selection purchased from our OFFLINE bookshop next to Gyeongbokgung Palace. Tell Us About ‘Your Korea’: If you’re a longtime resident of Korea and would like to share your story in KOCIS’s KOREA Magazine, shoot an email with your story idea to book@seoulselection.com.